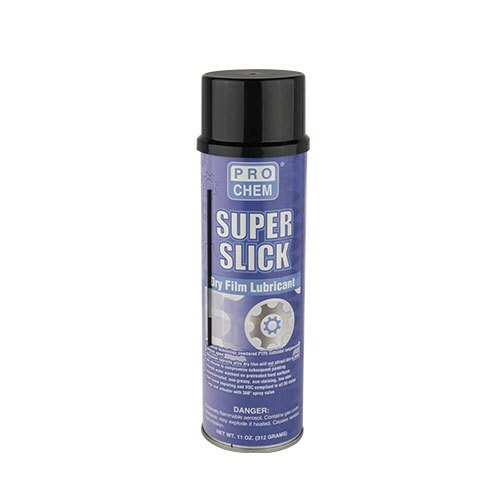 Super Slick | Pro Chem, Inc.
SUPER SLICK is ideal for use on surfaces that require lubrication without the dust catching after effects of a wet, greasy, residual film. This powder colloidal suspension release agent sprays out as an evenly dispersed coating, similar to a paint. There is no clogging, hot spots or missed areas that are common problems with other PTFE products. Polytetrafluoroethylene, or PTFE, is a material with one of the lowest coefficients of friction ever developed, providing greater lubricity than silicone or graphite. An excellent release agent for injection molding, the product easily separates the molded part and allows post-decorating without extensive, costly cleanup or adversely affecting the painting of the surface. SUPER SLICK has an active temperature range from –50ºF to +450ºF and is safe for use on most surfaces including wood, most plastics, metal, glass, etc. SHAKE WELL BEFORE USING. Spray in a light even coat, allowing the lubricant to dry to a white powder. Apply a heavier film or additional applications if more lubricity is desired. For extended usage, reapply periodically. For hard to reach areas or more controlled spray, insert extension tube provided.